Occasionally, we offer a “Rustic Study Tour” where we view private and public camps of the Adirondacks, led by experts in the field of architectural history and historic preservation. Evenings include lectures, free time, and Adirondack Trivia! The Adirondack Rustic Architecture Study Tour is geared towards two different types of groups: the general public and specific groups. We currently do not have a tour scheduled, but please contact us if you are interested in scheduling this program in the future. Adirondack Museum, Blue Mountain Lake: This first-class institution features collections, historic artifacts, and archival material that document the region’s past. Twenty-two exhibit spaces and galleries tell the stories of the men and women who have lived, worked and played in the largest wilderness area east of the Mississippi River. Hemlock Ledge, Tupper Lake: A privately owned camp, Hemlock Ledge is one of the most remarkable, intact, and little known camp complexes in the region. It was designed in 1907 by New York architect Julian Clarence Levi and includes several buildings, including rustic Birch Cottage, and some notable interiors. Evening lecture by local historian and Coulter expert, Mary Hotaling on The Rustic Camps of William L. Coulter. 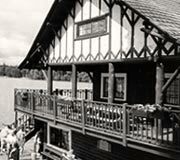 Raquette Lake and the Architecture of William West Durant: Travel by boat to Camp Pine Knot on Raquette Lake. This great camp was designed by William West Durant, and once owned by Collis P. Huntington, one of the leading railroad entrepreneurs of the nineteenth century. You will have a guided tour of this National Historic Landmark owned by the State University of New York College at Cortland, and operated as the Center for Environmental and Outdoor Education since 1949. 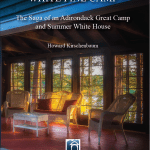 We will then visit Great Camp Sagamore, once the summer residence of the Vanderbilt family. This National Historic Landmark is comprised of twenty-seven buildings, including an outdoor bowling alley. The day will end with a tour of Camp Uncas, a truly remarkable Great Camp and recently listed (2008) National Historic Landmark. Camp Uncas, once the summer residence of J. Pierpont Morgan, is a privately owned camp graciously opened to us exclusively for this tour. 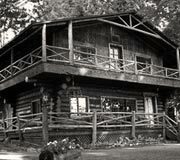 Camp Winnetaska, Upper St. Regis Lake: Mr. And Mrs. Augustus W. Durkee of New York City purchased the original fourteen acre property in 1886 and began building in 1887. At this time, the property was only accessible by water. The first guests to arrive by automobile are recorded in 1917. The dining room, kitchen and little living room were first constructed, and tents were used for the bedrooms for the first several years. The Durkees occupied the camp for the next fifty-four years. The property changed hands over the next several years, and an additional four acres was added to the original Durkee camp. 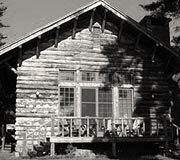 In 1980 the property was divided, and the guest cabin was moved back from the waterfront and made a separate camp. “Spruce Knot,” the original name of the old camp was transferred to the new, smaller camp. 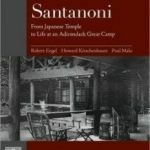 Camp Santanoni, Newcomb: Camp Santanoni was built beginning in 1892 by Robert and Anna Pruyn and eventually consisted of more than four dozen buildings on 12,900 acres including a working farm, Gatelodge complex, and a huge rustic Main Lodge and other camp buildings situated on Newcomb Lake. Santanoni was in private ownership until 1972 and over the last several decades, in state ownership, it has gradually been restored by a partnership between NYSDEC, AARCH, and the Town of Newcomb. Santanoni is listed on the National Register of Historic Places and is a National Historic Landmark.